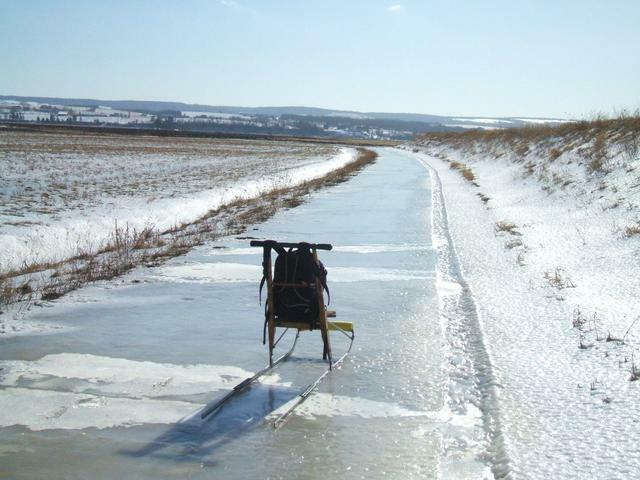 About 30 of snow came down Dec 4, but after 2 days the snow had completely slushed down and refroze to a skatable surface. 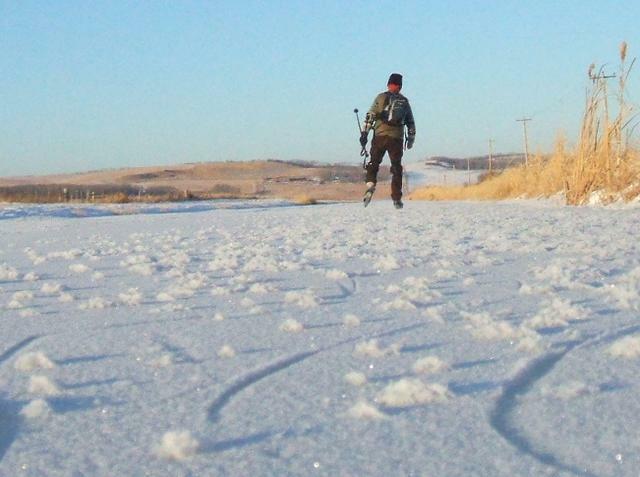 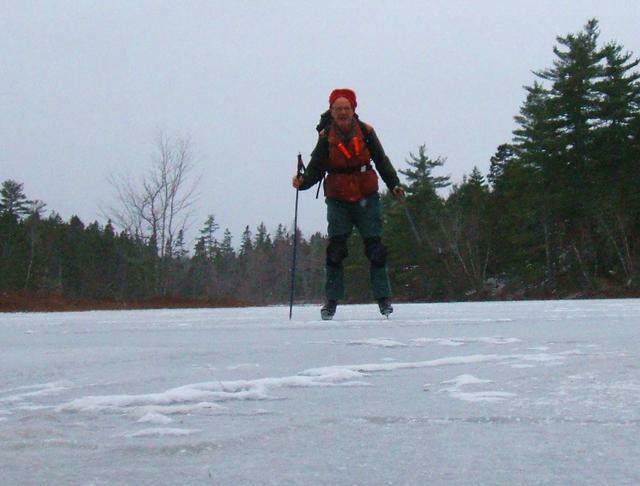 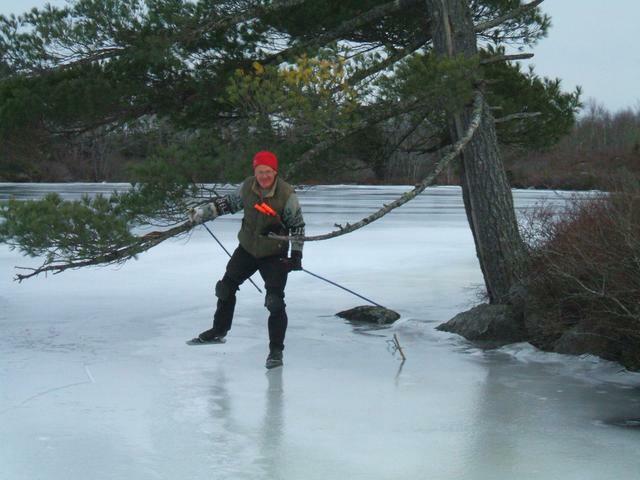 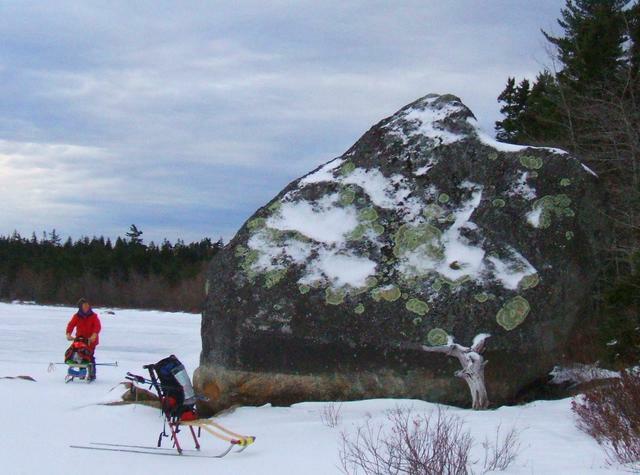 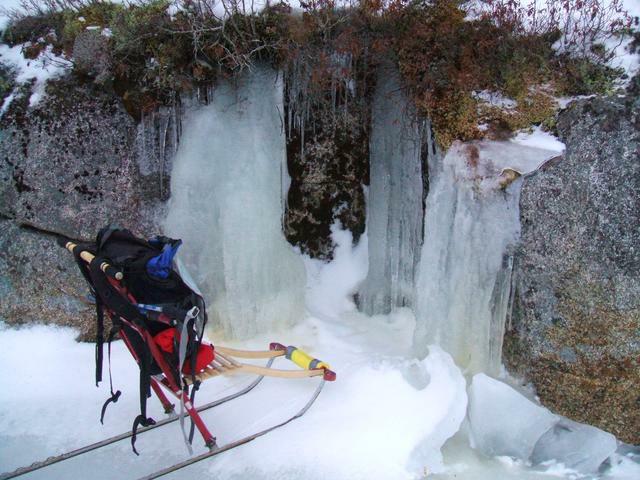 Even after 5 more cm of snow on Dec 8 it was still skatable, at least by double-poling. 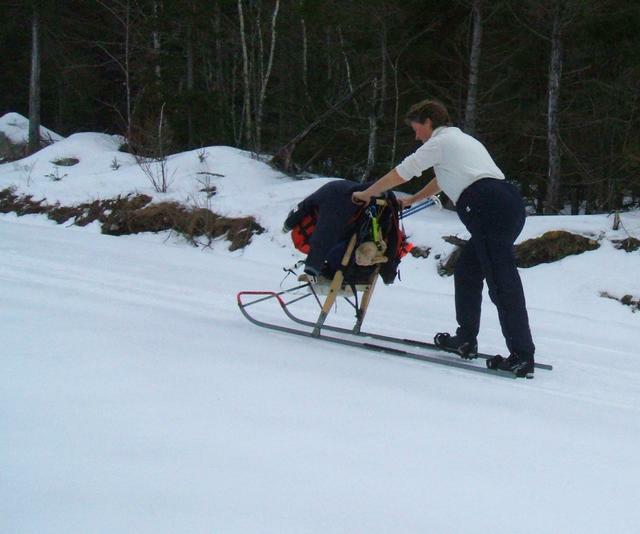 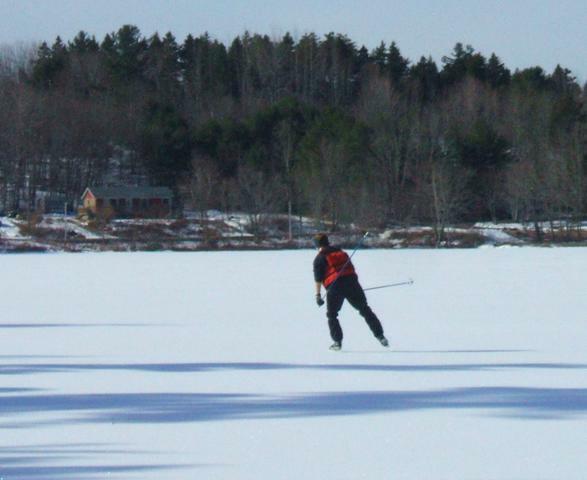 Skiing conditions were excellent. 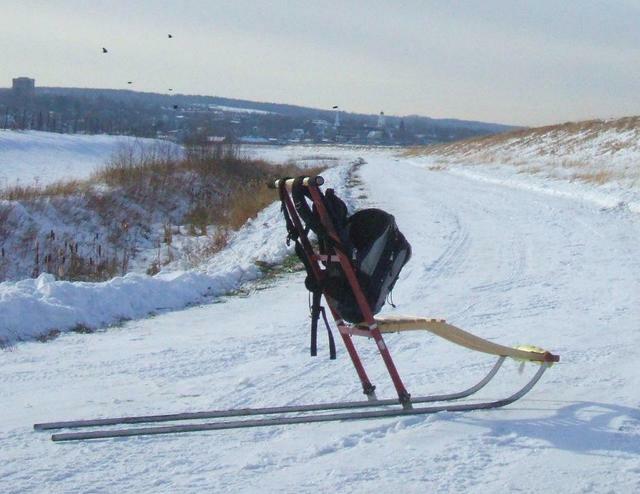 Wolfville dike roads, Dec 19 2007 A quick kicksled ride for lunch from Wolfville on the road along the base on the dikes. 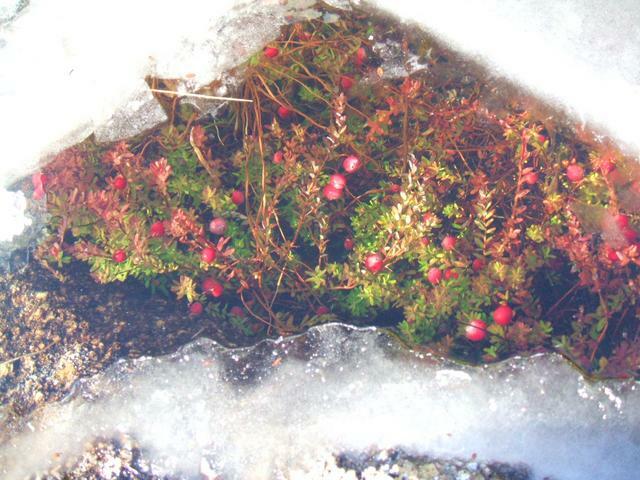 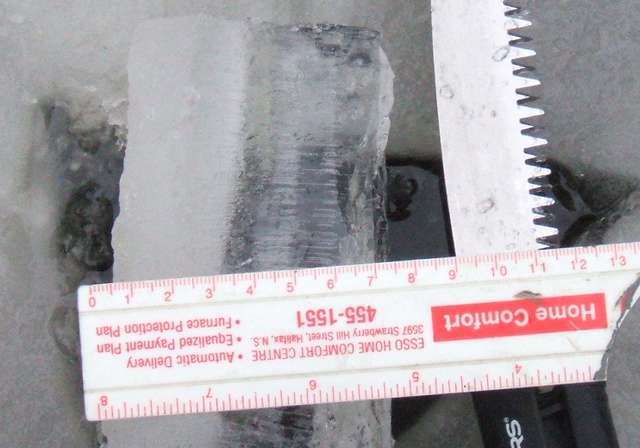 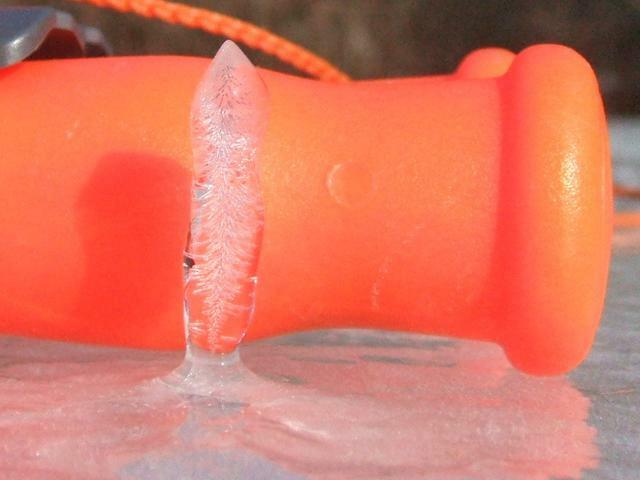 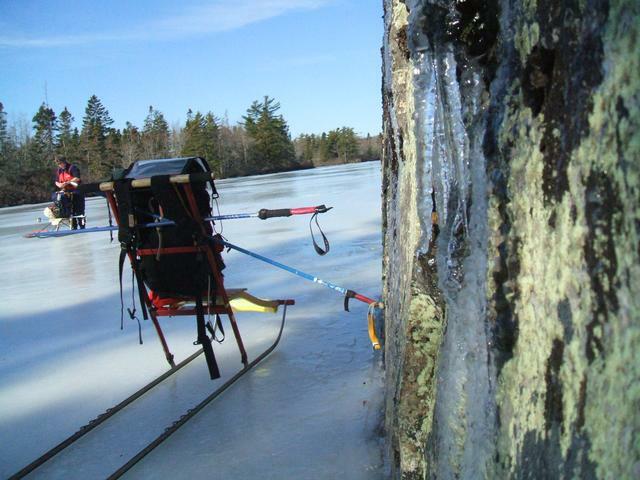 Excellent ice after a thaw, for only 2 days before another big snowfall CARPE DIEM GLACIALEM! 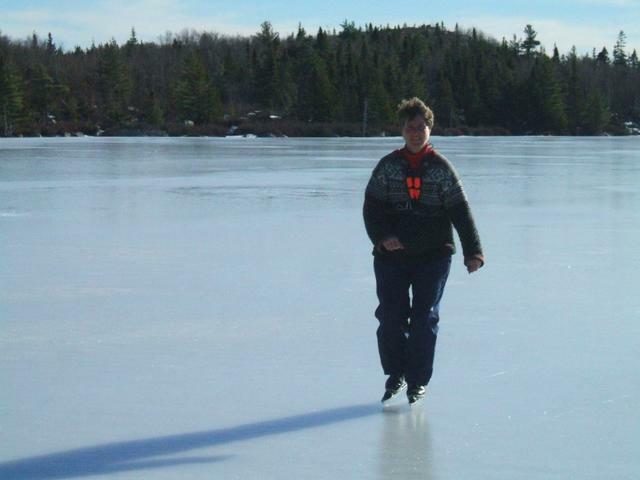 Jan 13; Cranberry Lake, skates and spark It was difficult to choose between skates and spark, so we tried to use both at the same time! 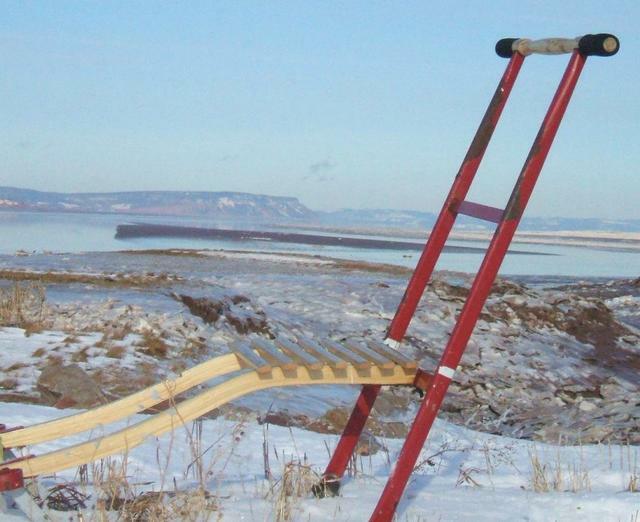 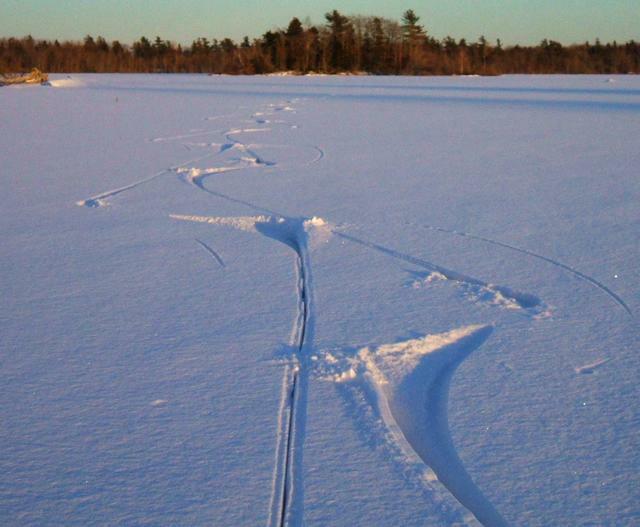 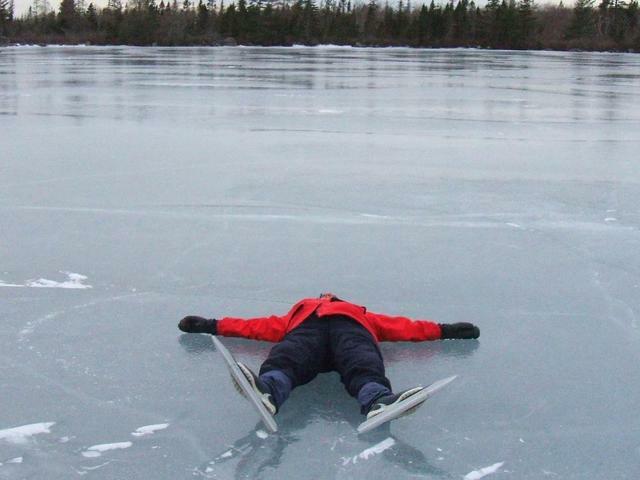 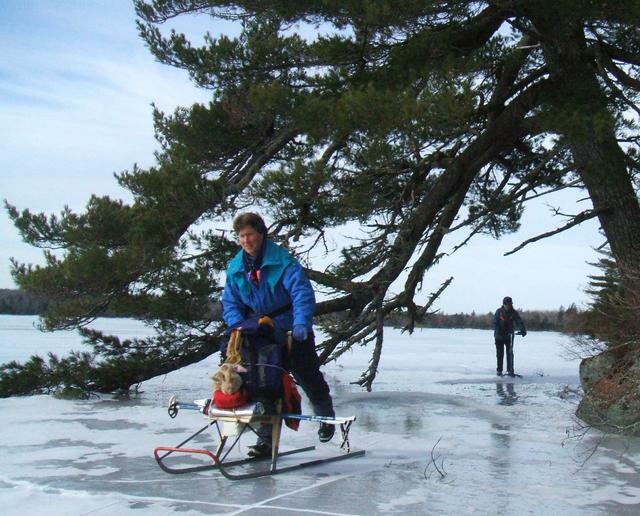 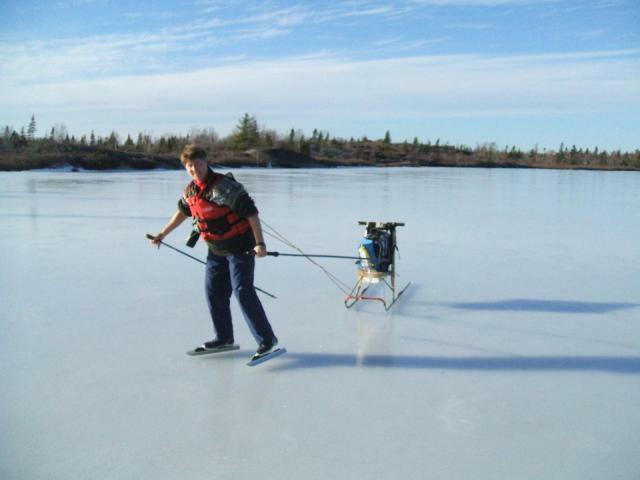 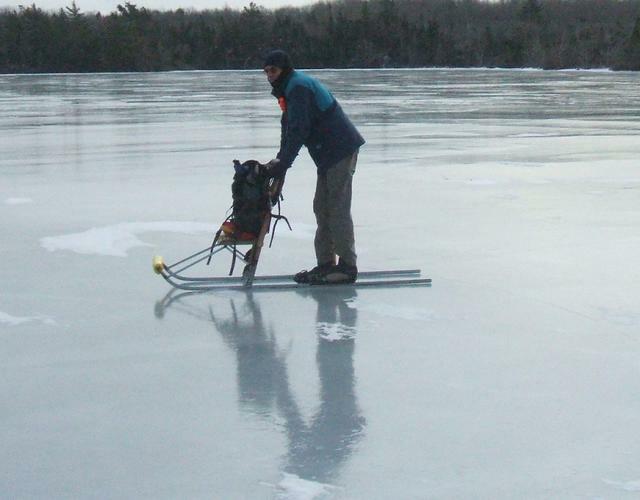 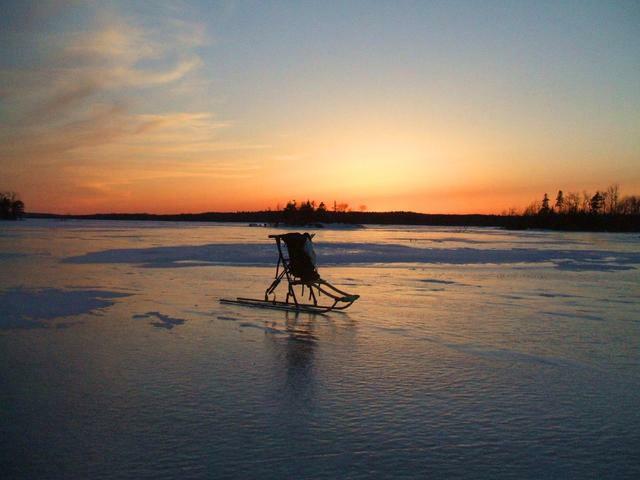 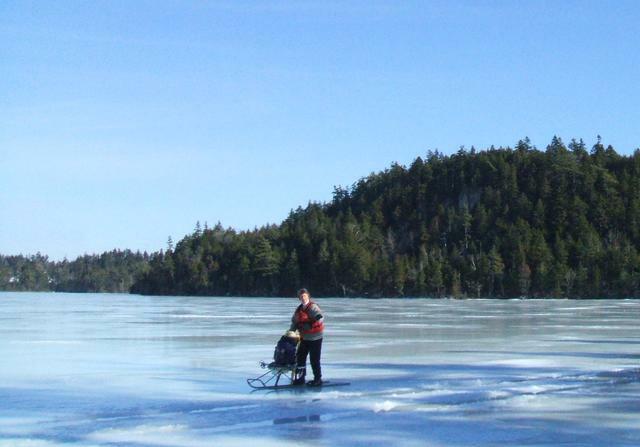 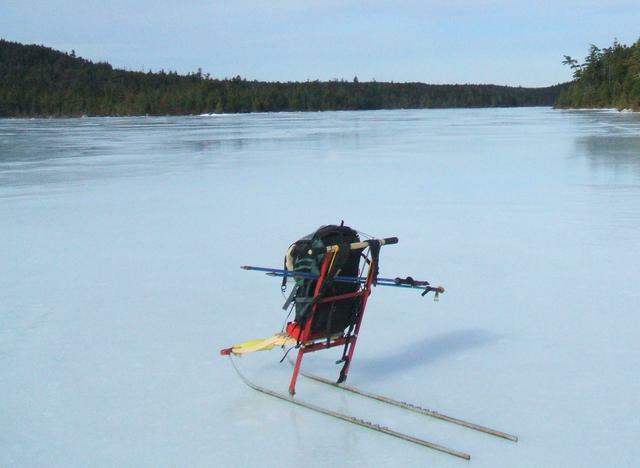 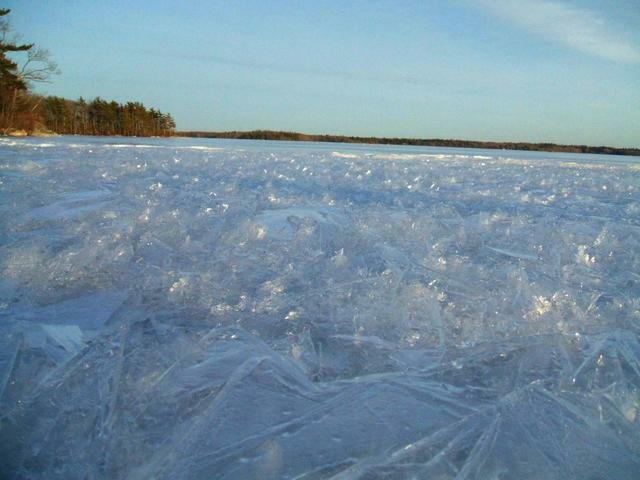 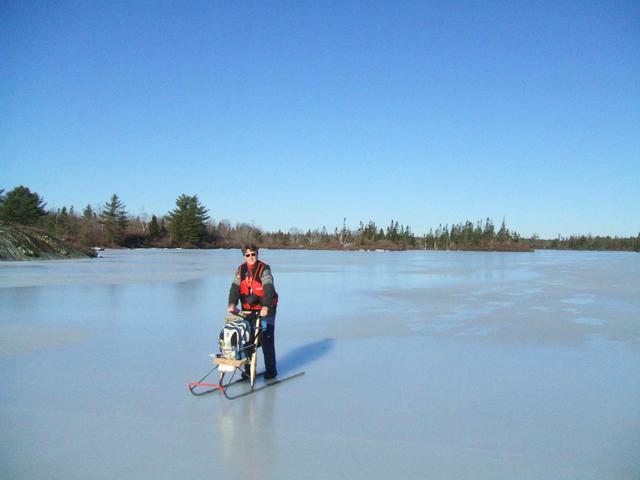 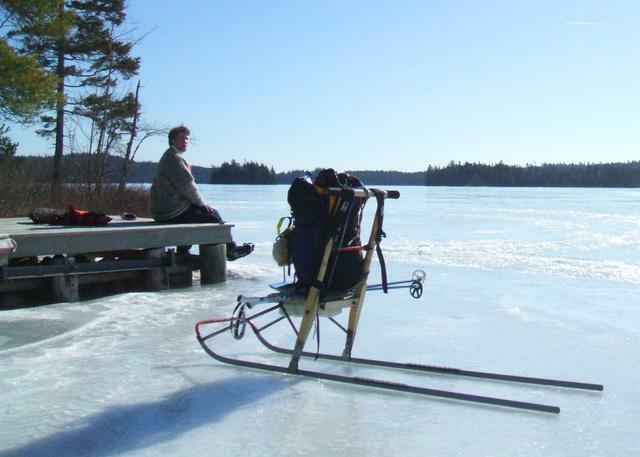 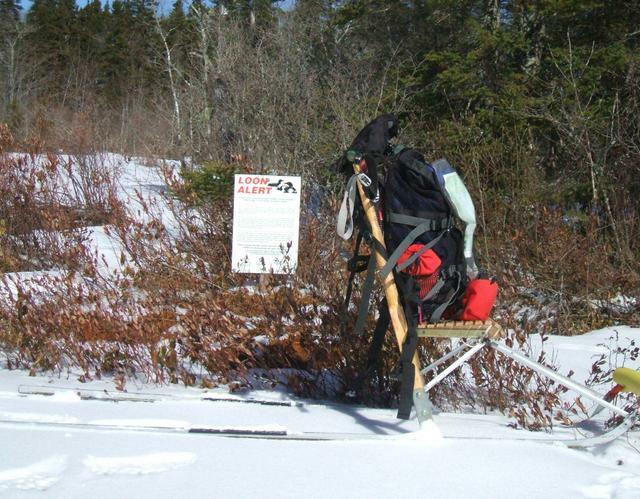 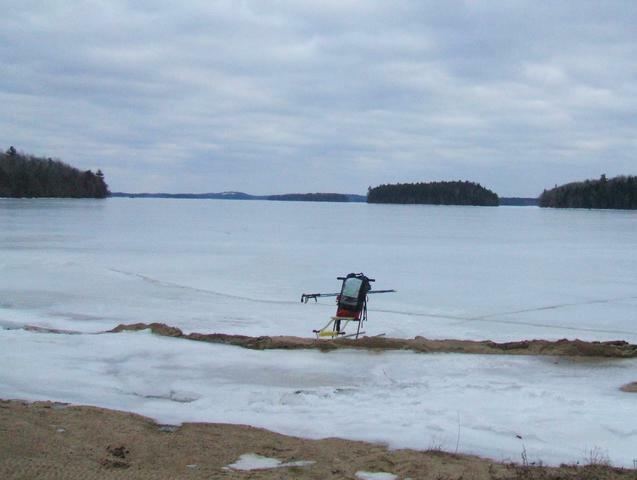 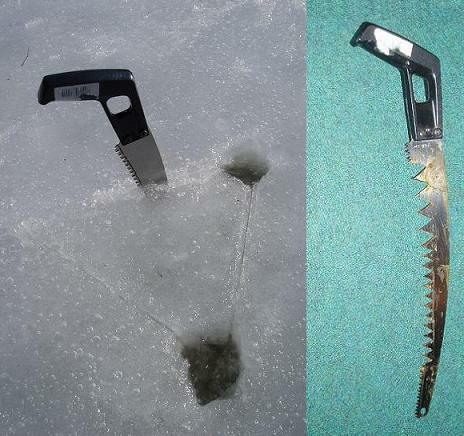 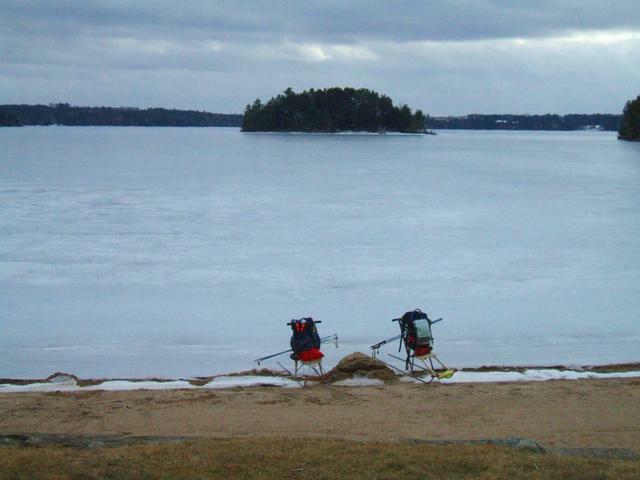 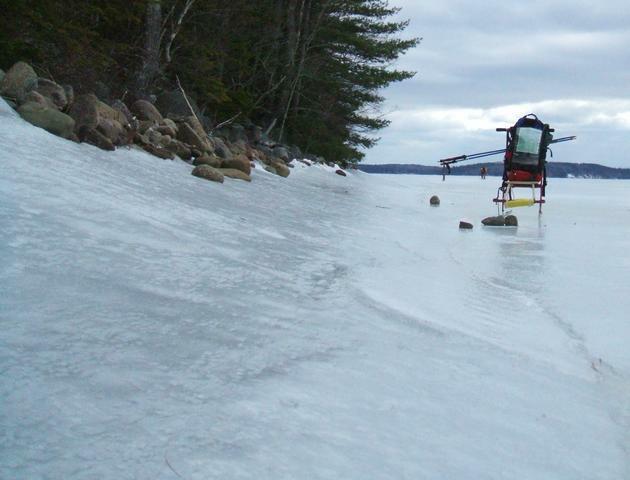 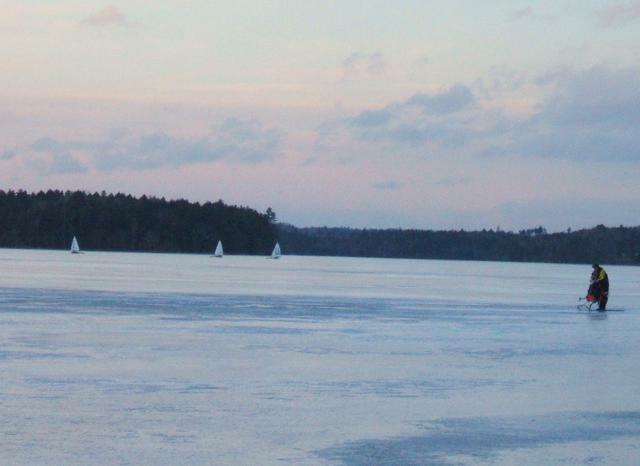 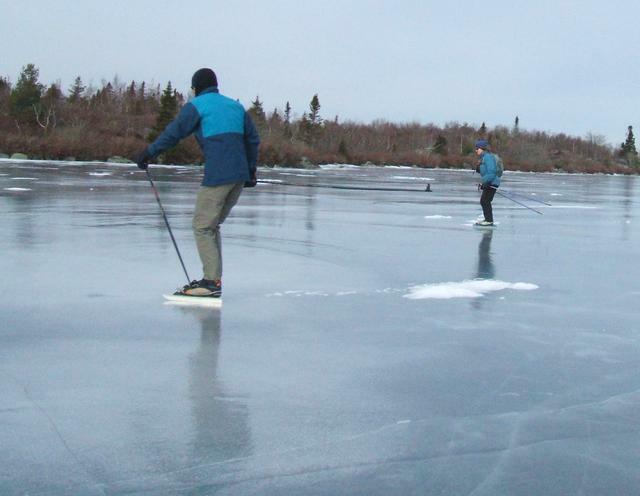 A new lake for ice travel. 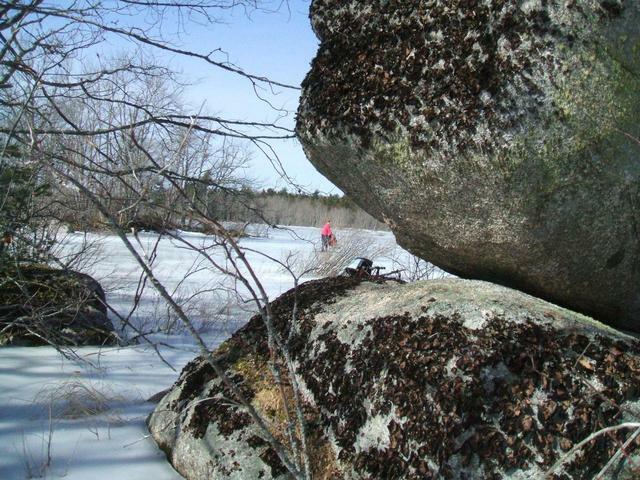 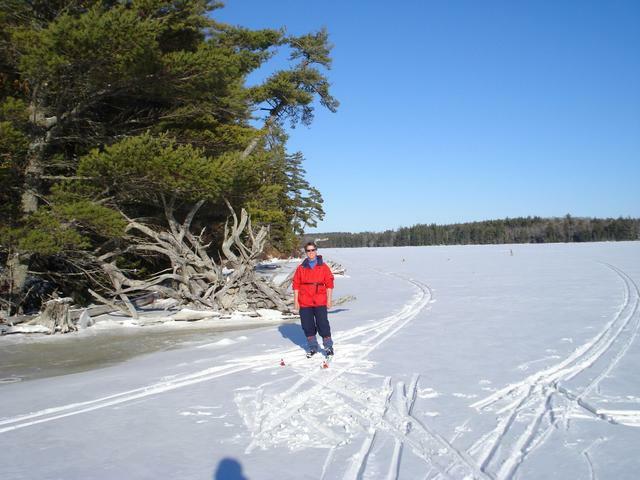 When we paddling on this lake last August, we noticed lots of unripe cranberries. 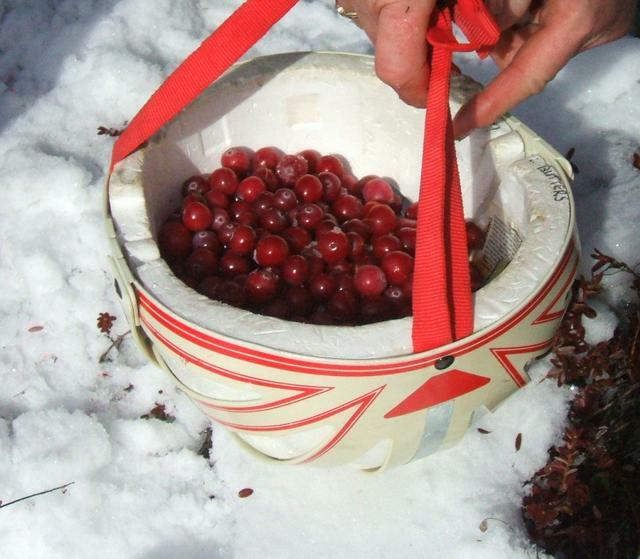 Today there were still lots of ripe, preserved cranberries! 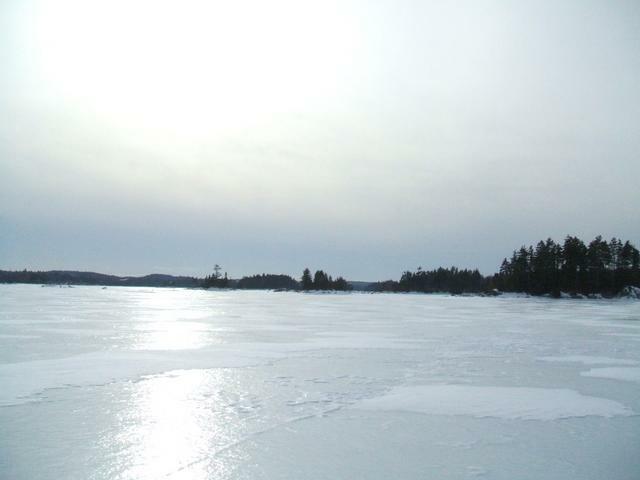 Ice surface was variable, some smooth ice, some old snow drifts made rougher ice, the light snow from yesterday had blown into new snowdrifts. 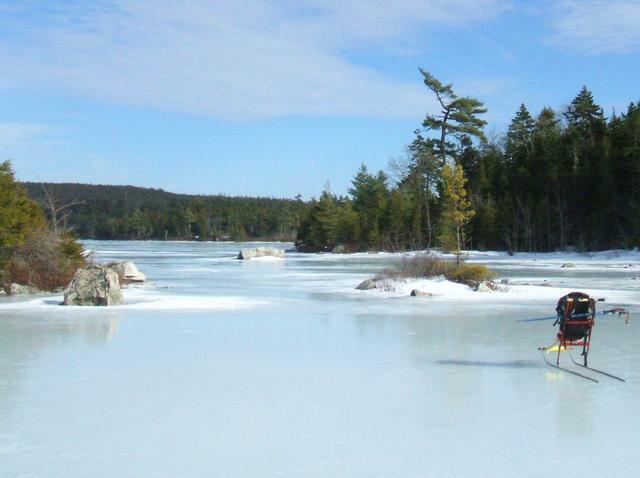 Skating was possible but we mostly stayed on the kicksleds, completely circumnavigating the lake, in all its coves- about 21 km. 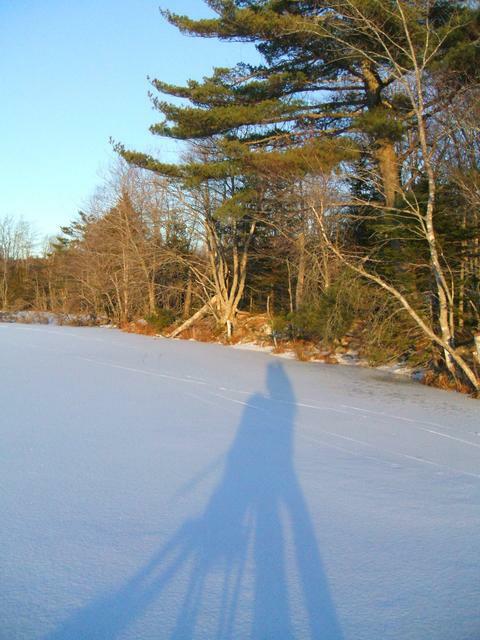 Feb 01 2008; Westhaver Lake, hither but no farther, open water at north end of lake, where Timber Lake Brook flows in. 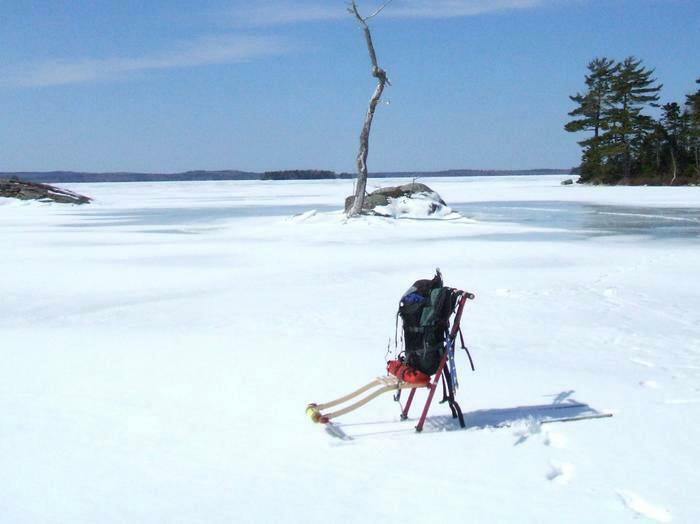 When I checked the map later, I found out that it was only a 2 km portage to the end of Panuke Lake, where I had been several winters ago! 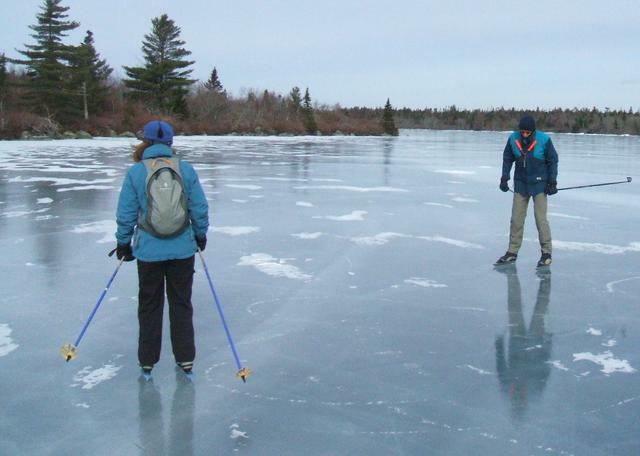 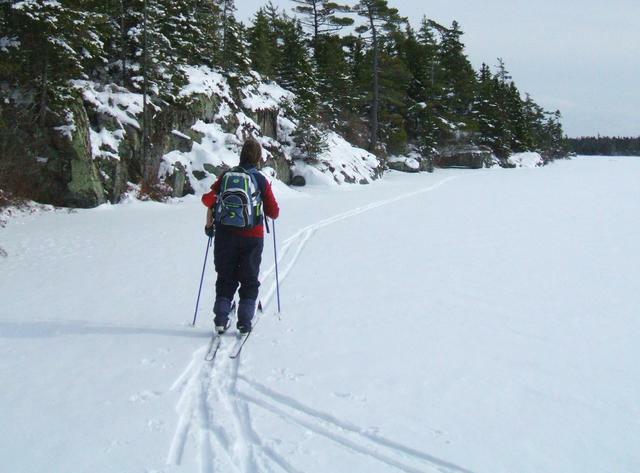 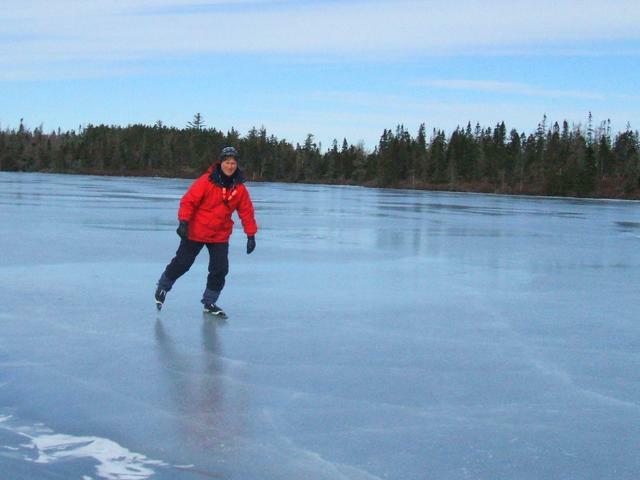 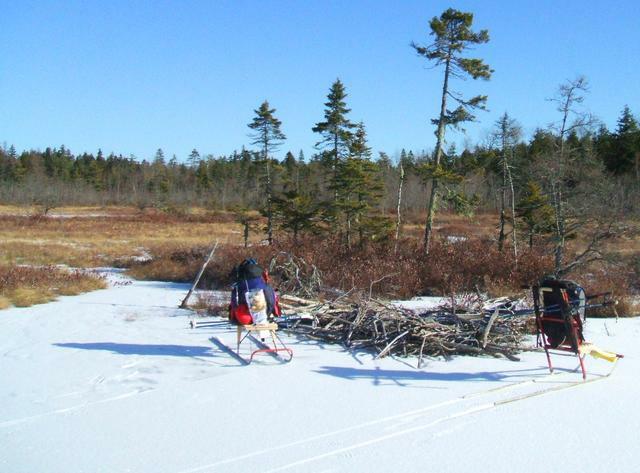 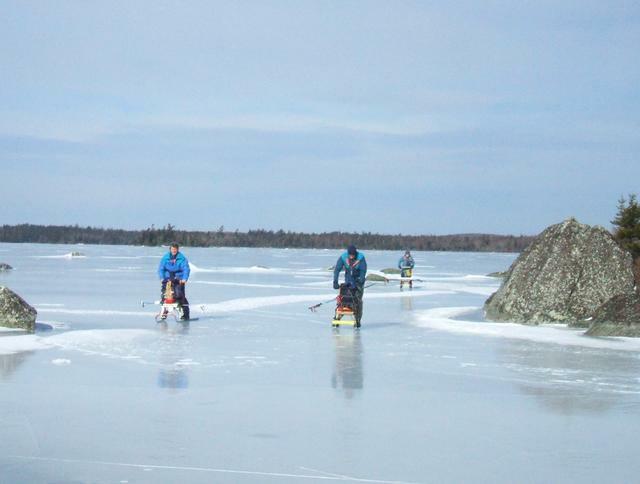 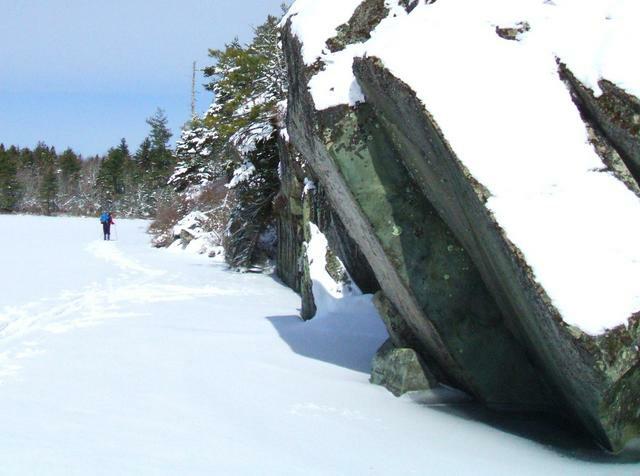 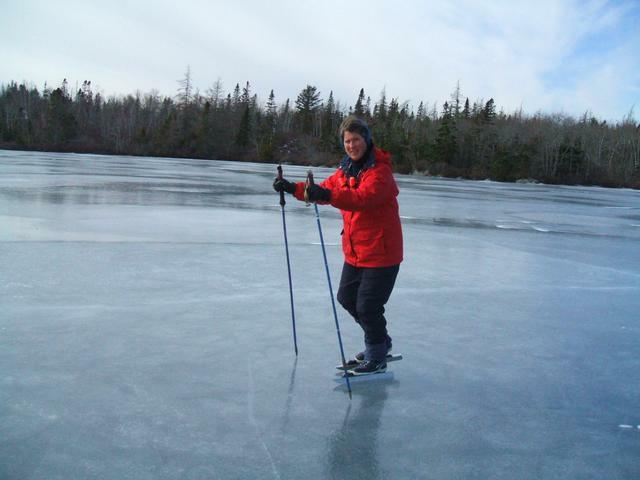 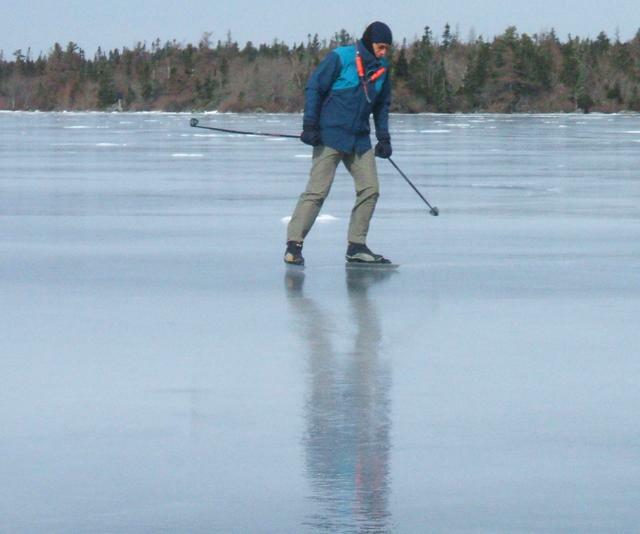 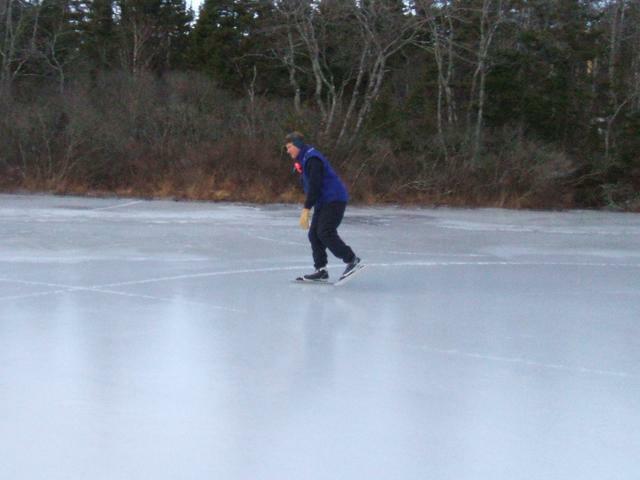 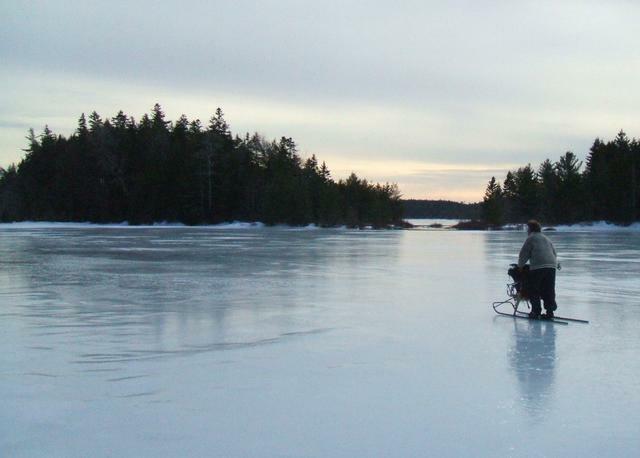 Lunenburg County is one of best areas for tour skating and kicksledding in Canada! 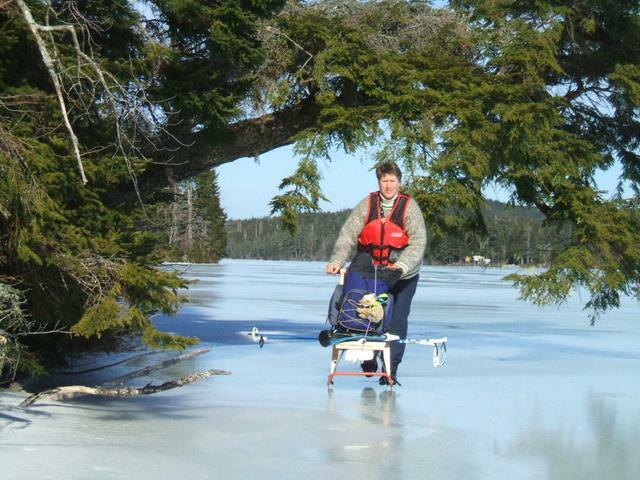 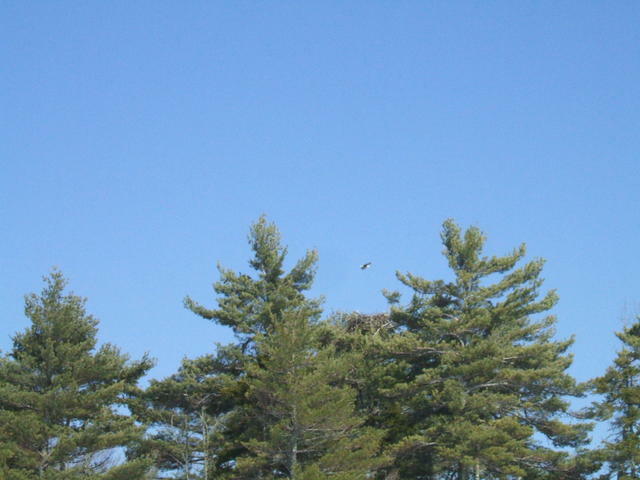 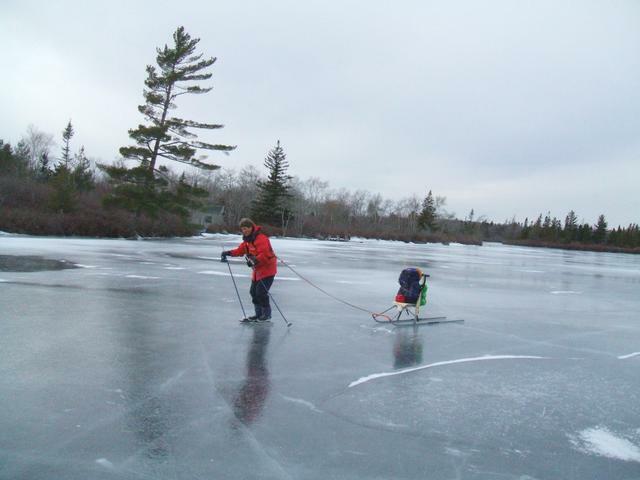 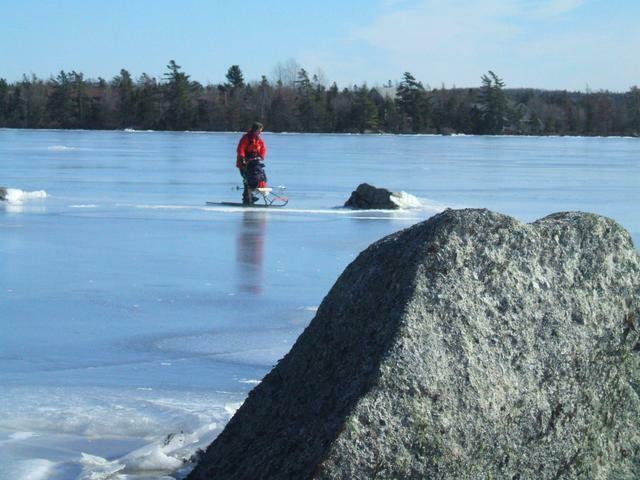 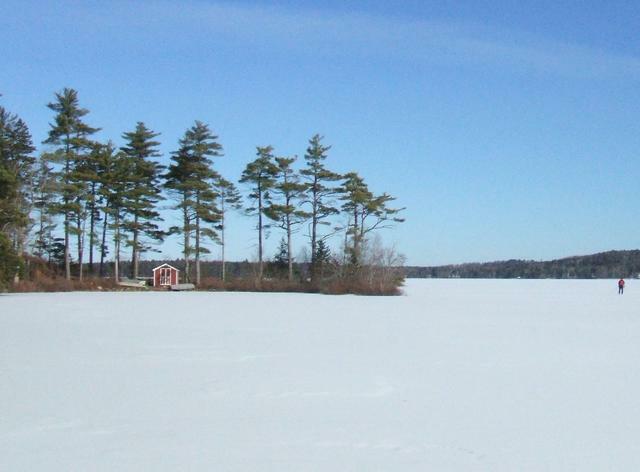 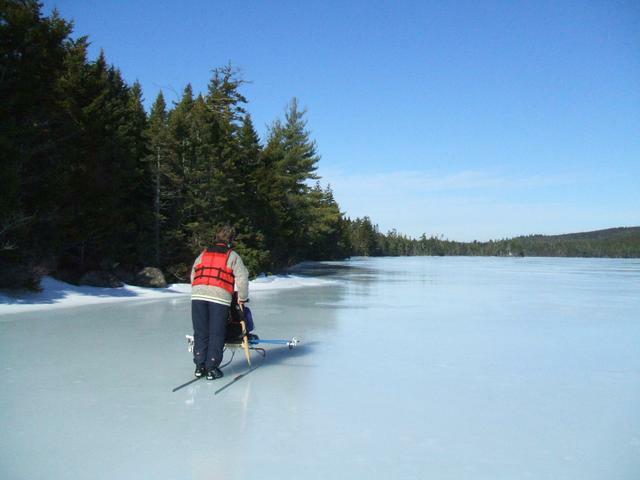 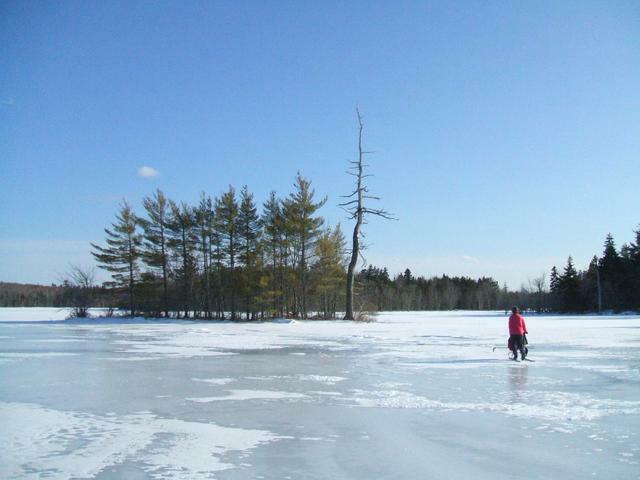 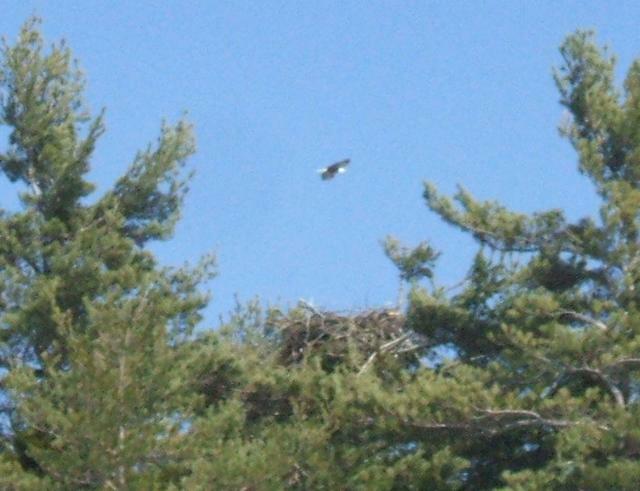 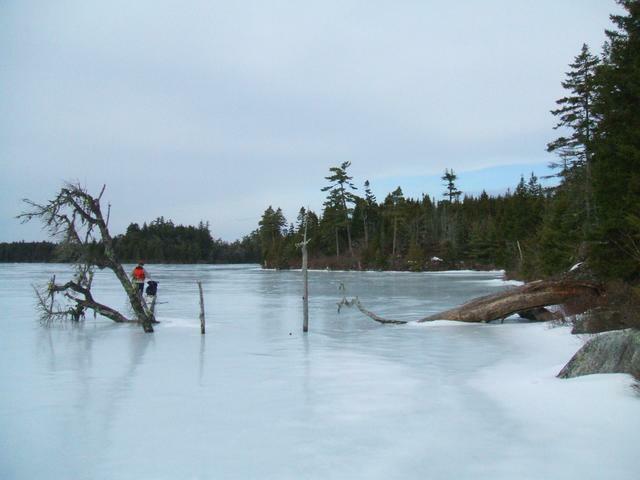 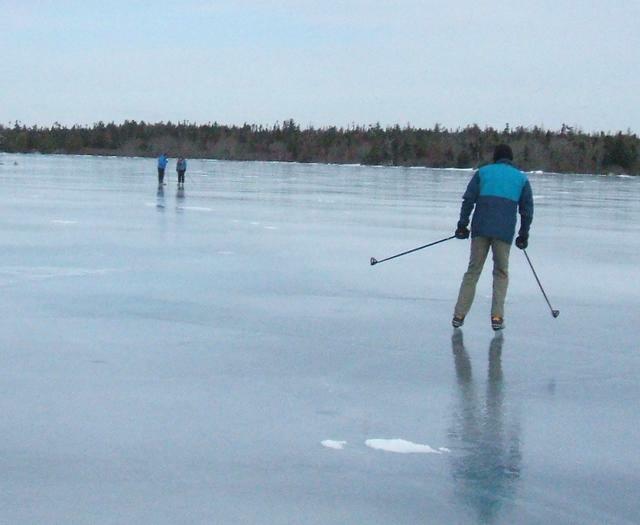 Within 30 km of Bridgewater there are over 50 lakes of various sizes. 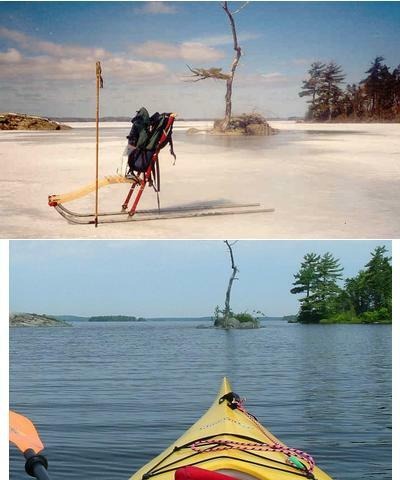 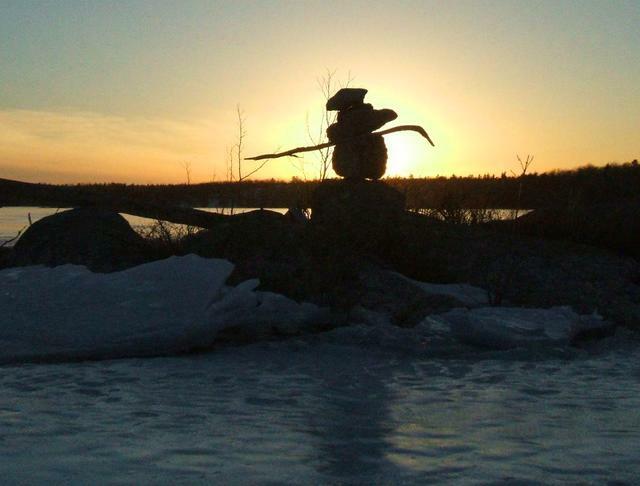 Big Mushamush has a shoreline of 32 km. 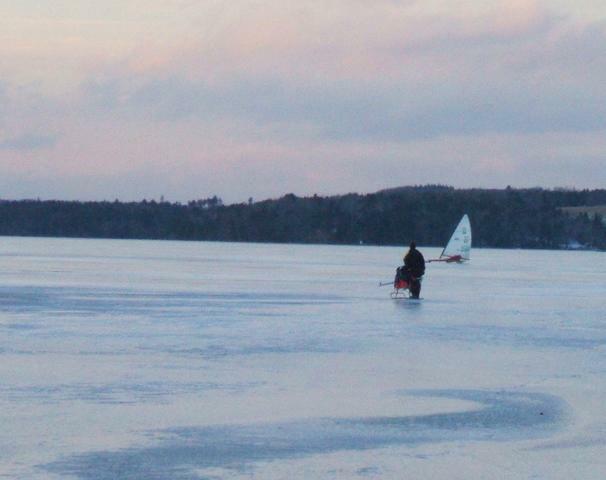 Today was mostly grey and we would have liked less wind, but the ice-sailors liked the wind! 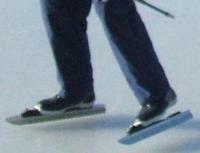 Total distance on kicksleds and skates was 38 km. 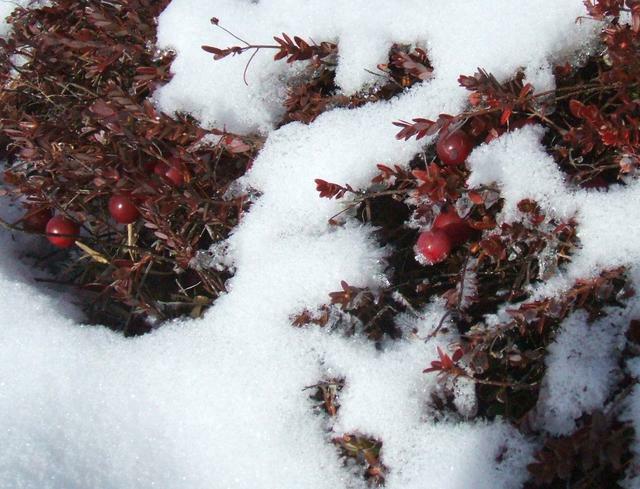 Just a dusting of snow, sun and light winds. 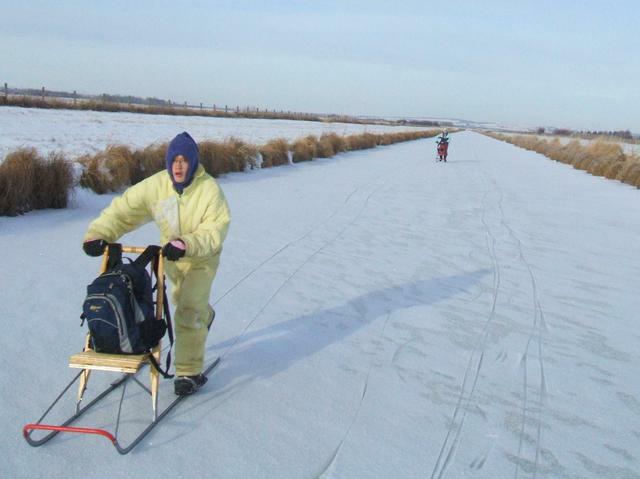 Total 42 km. 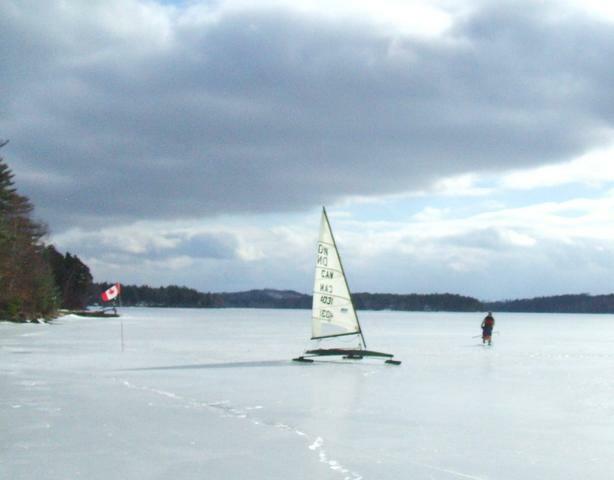 Feb 04 2008; Is Fancy Lake in Sweden? 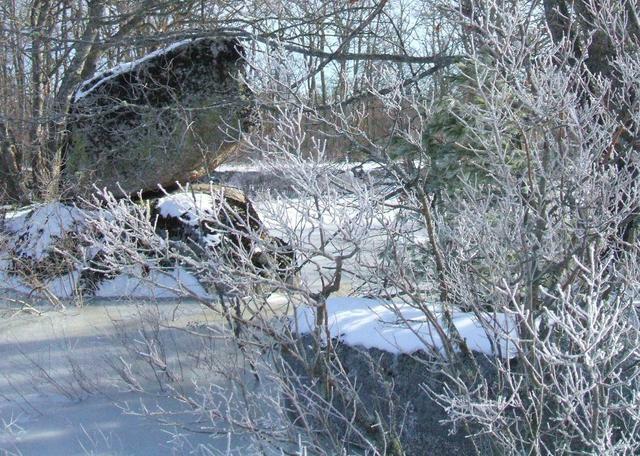 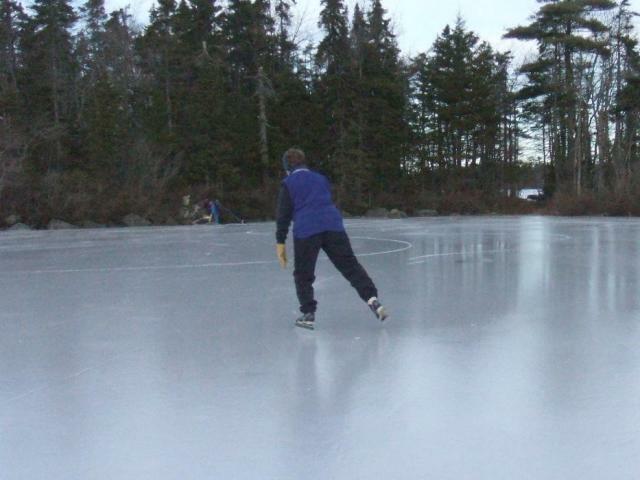 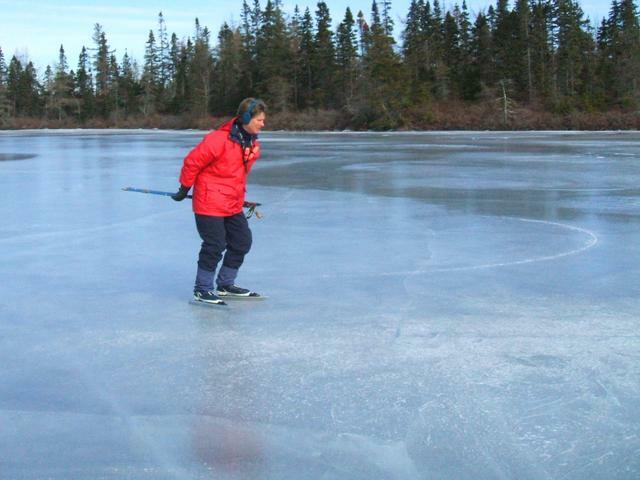 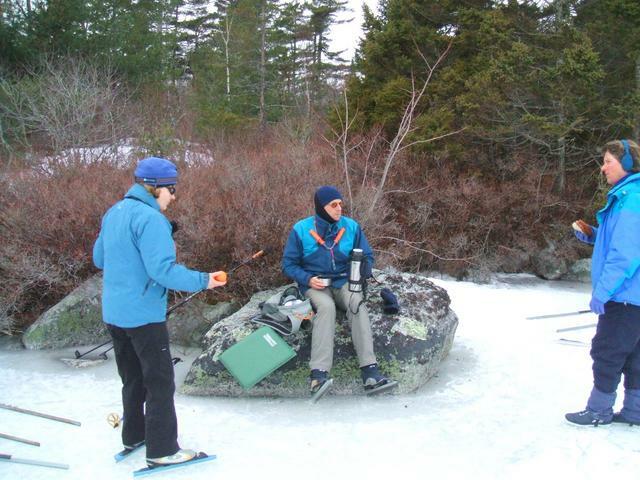 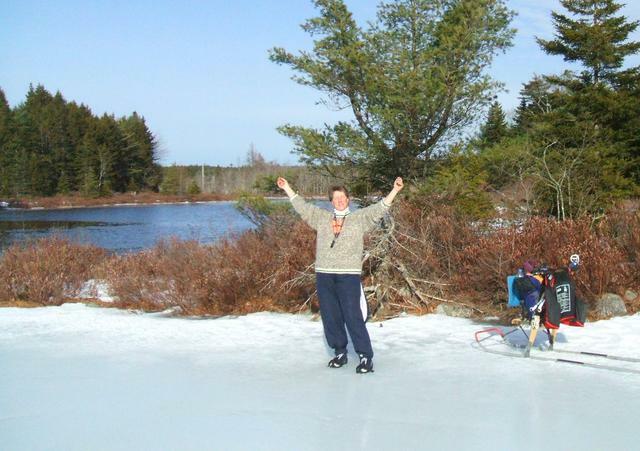 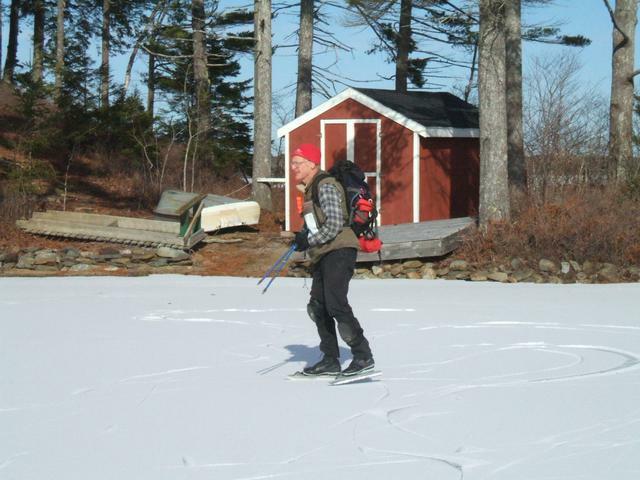 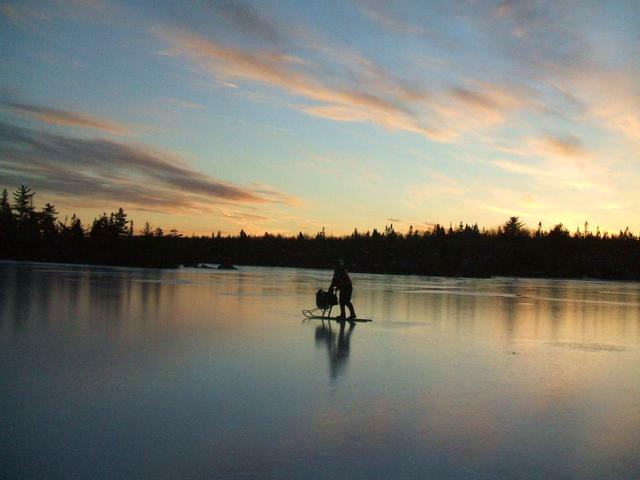 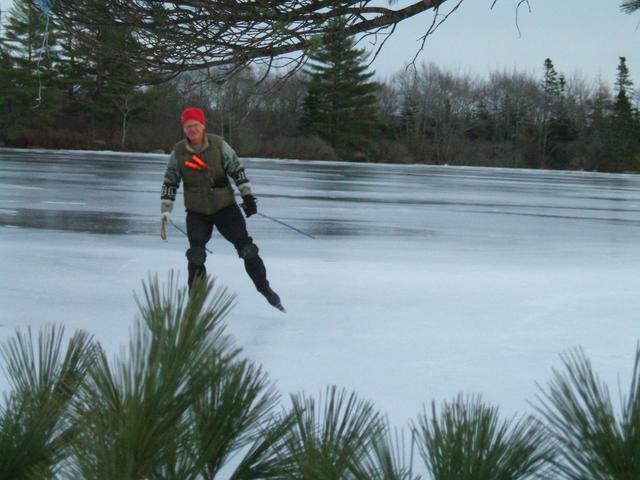 , the ice, the skater, the trees, the cabin in "Falun Red"; it all looks like Sweden! 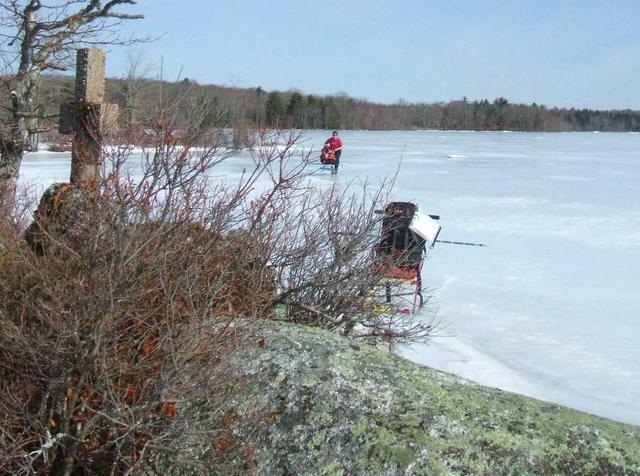 Feb 04 2008; Fancy Lake golf on ice? 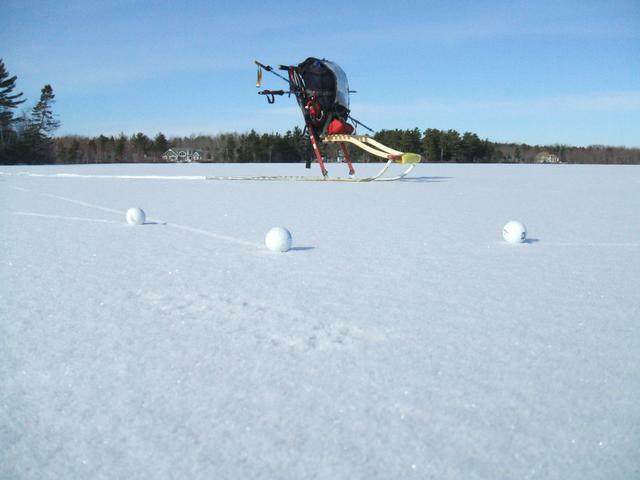 We saw about 10 golf balls an the ice. 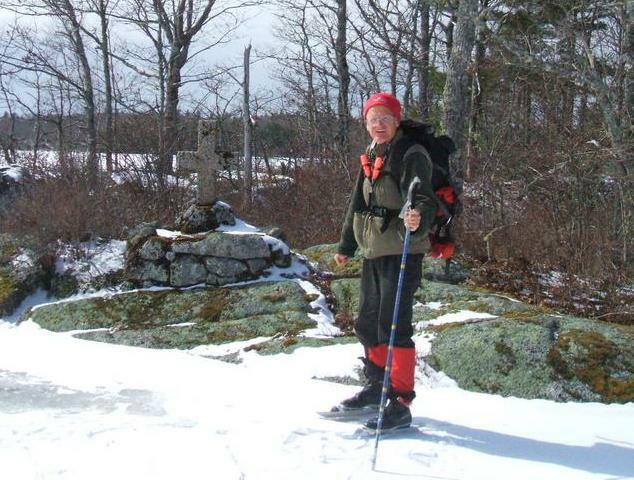 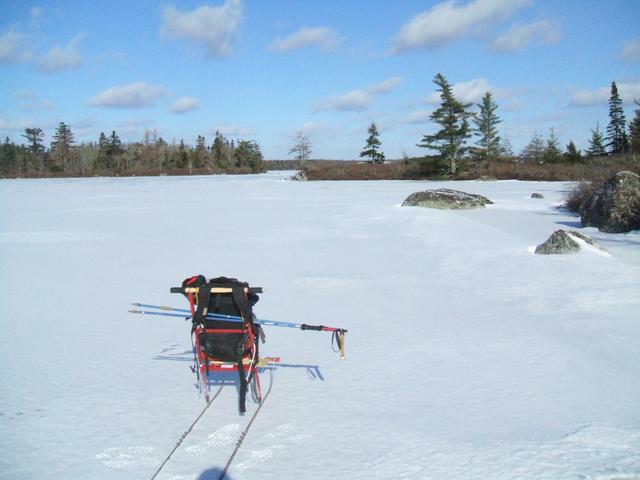 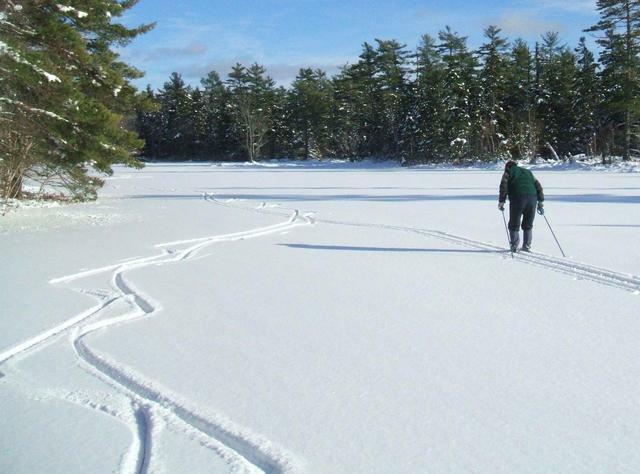 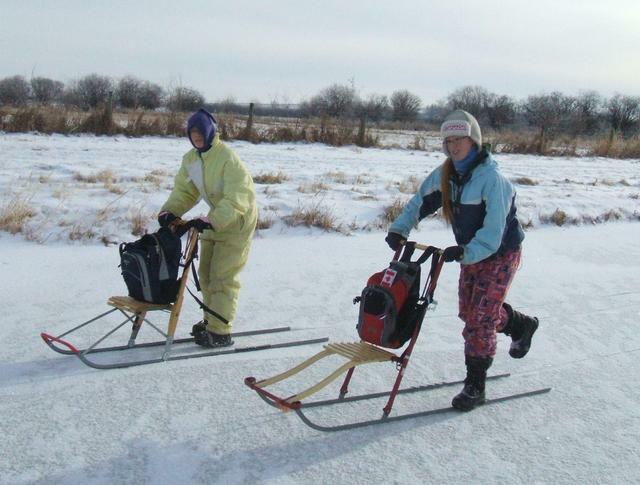 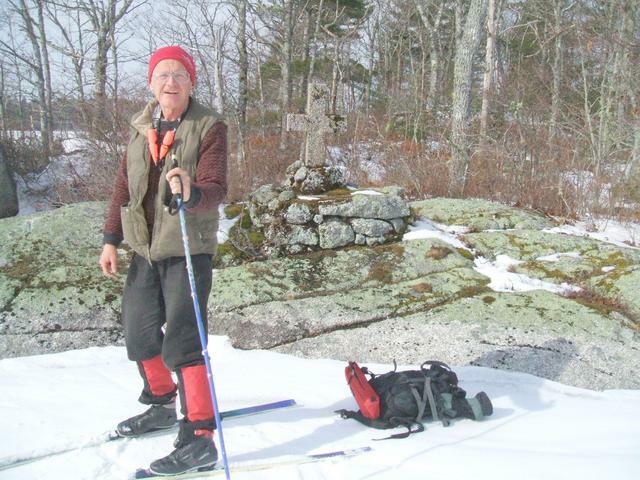 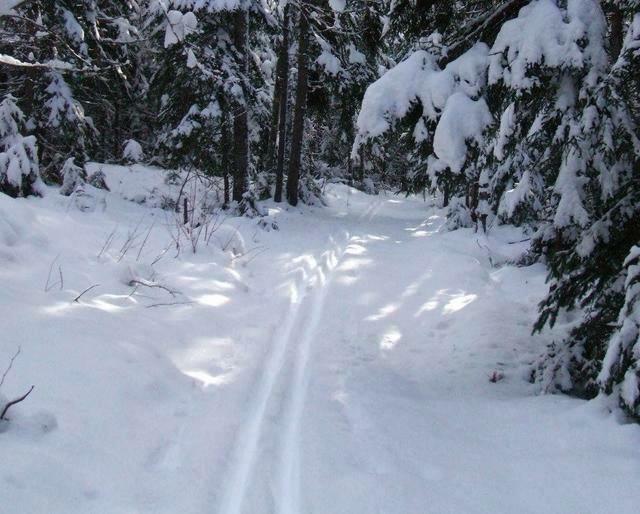 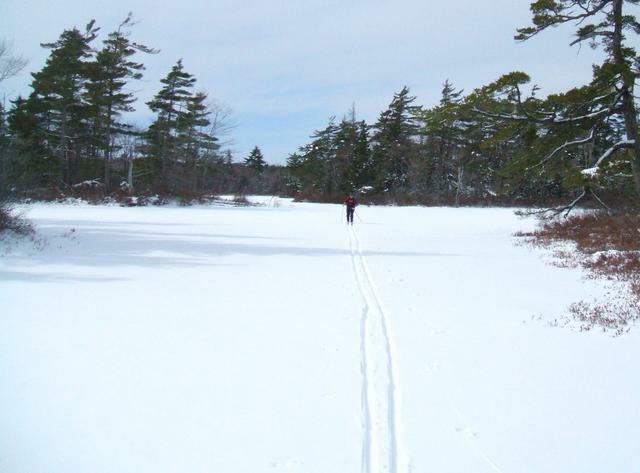 We finally got John and Ruth out on both kicksled and Nordic skates. 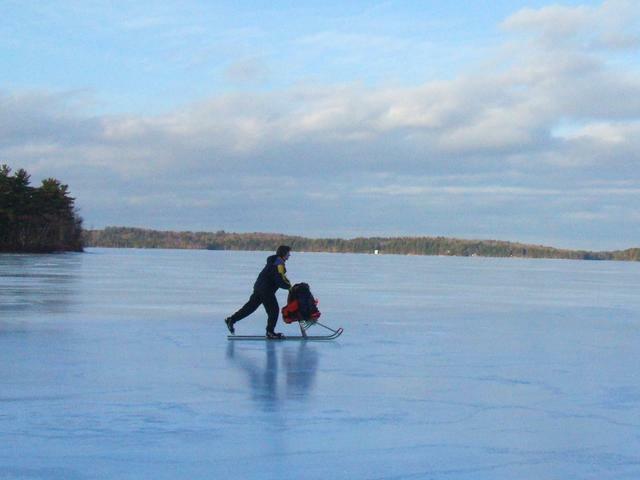 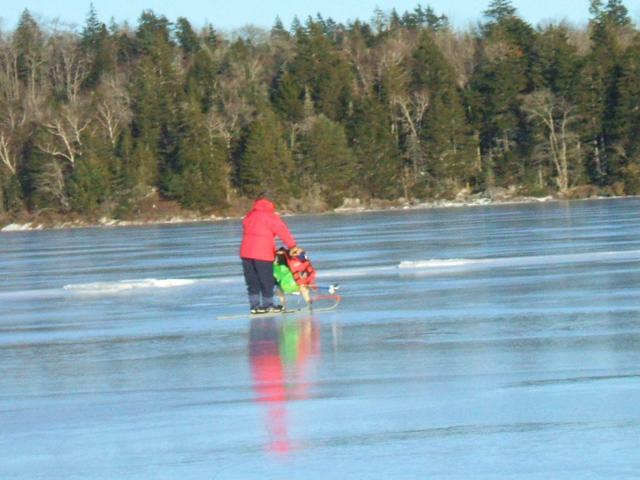 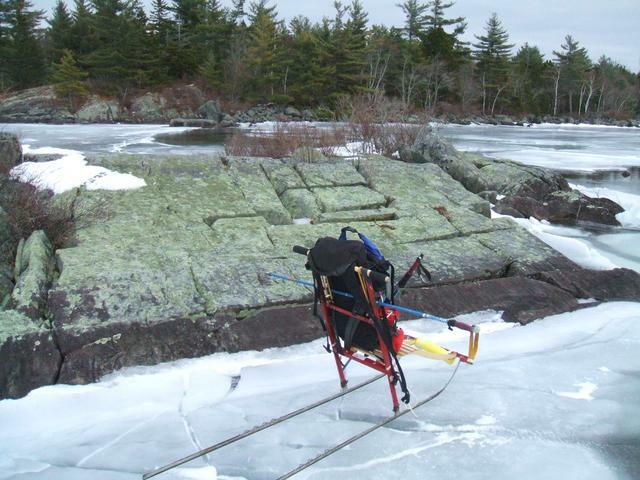 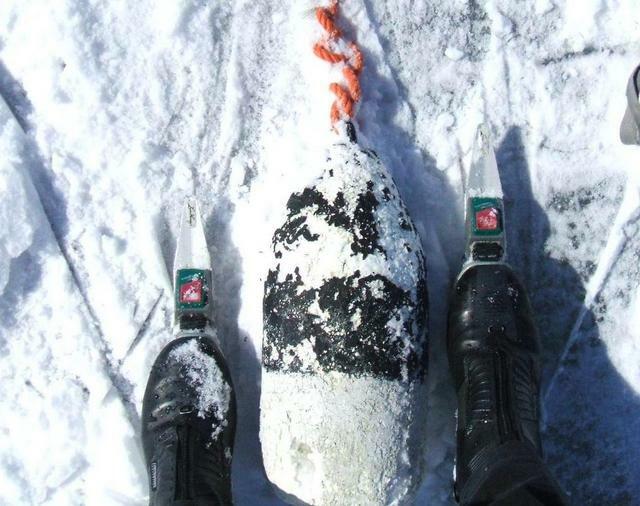 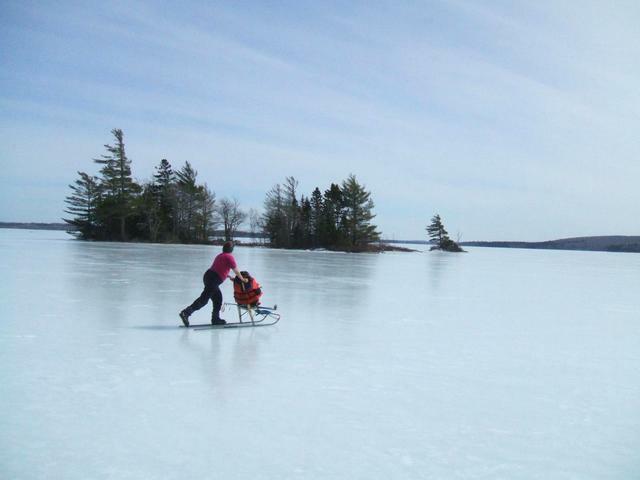 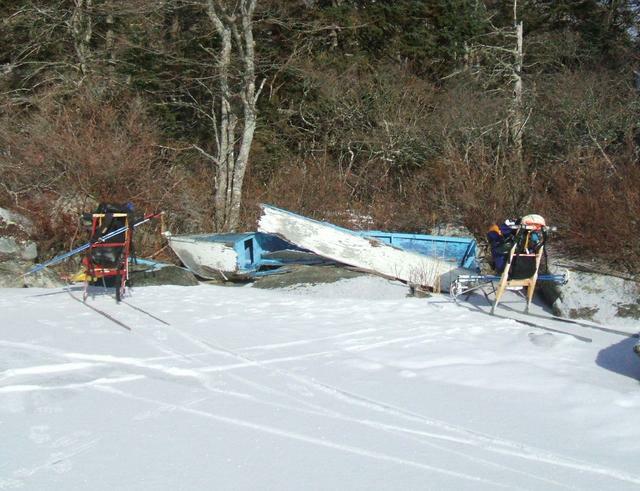 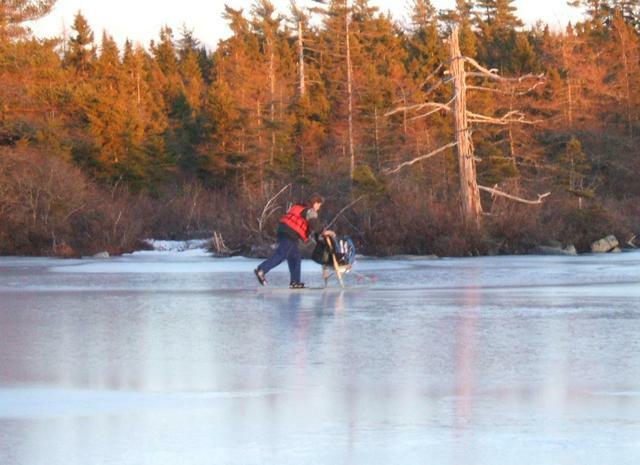 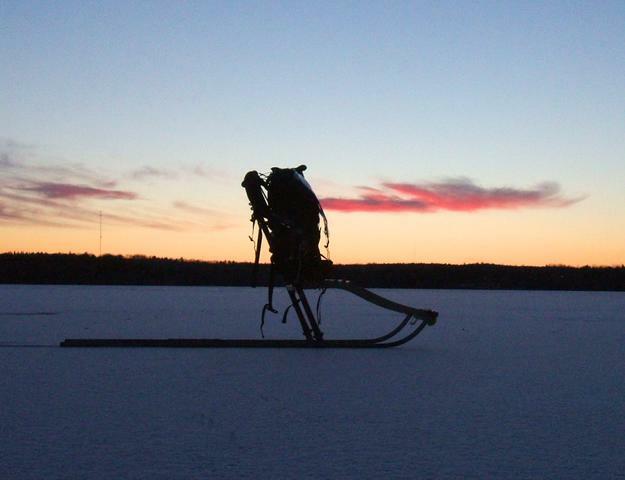 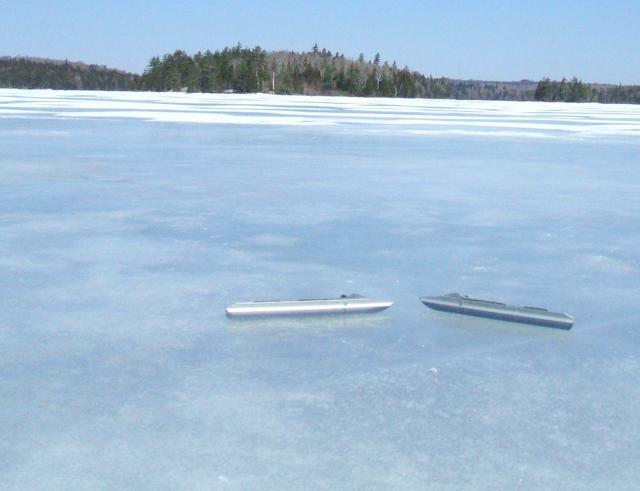 So today we had 4 kicksleds and 4 tour skaters on one lake- a new Nova Scotia record! 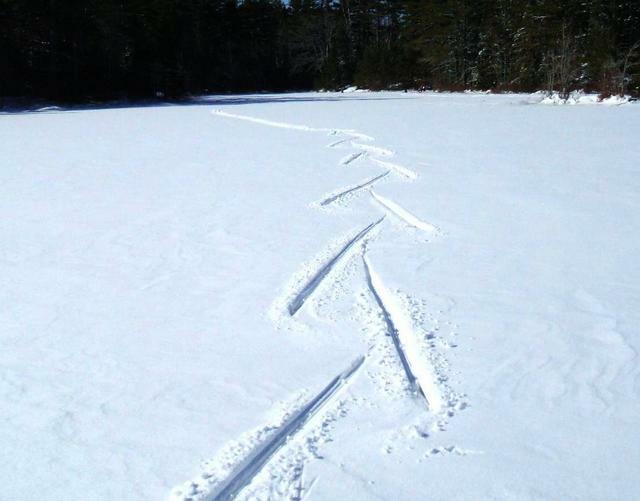 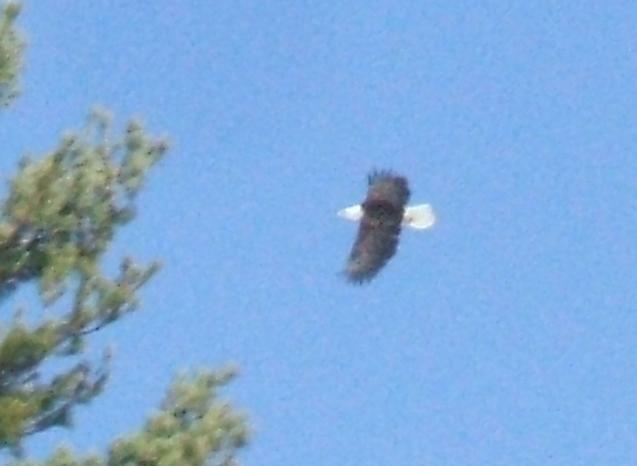 Return to Wrights Lake. 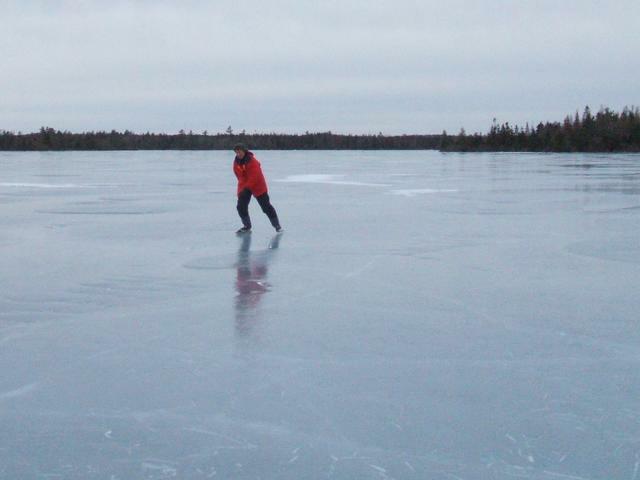 Heavy rain a few days before raised the water level about 50 cm, flooding the shoreline, making it difficult to get on and off the ice. 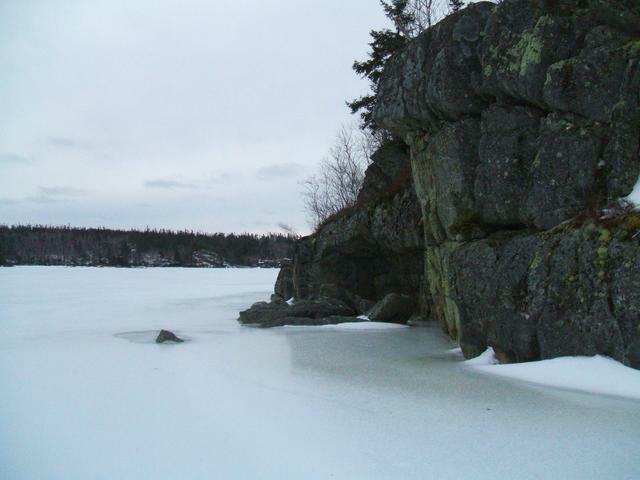 Feb 26 2008; Gaspereau Lake morning frost and the "balanced rock"
Mar 11-14 Lakes in the area had some snow . 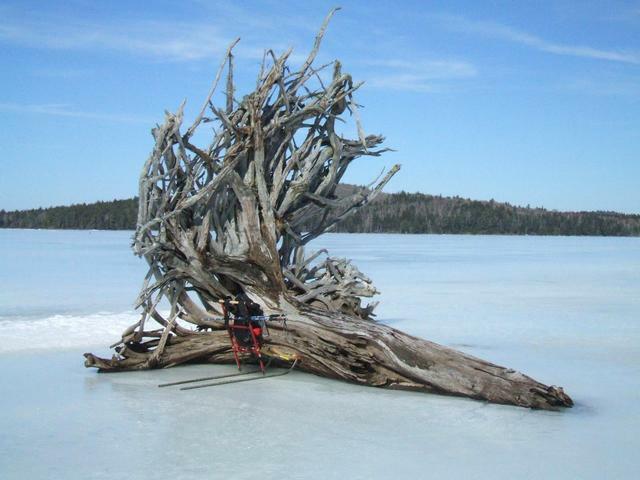 Spider Lake is a small lake but its 8 arms give a shoreline of about 12 km. 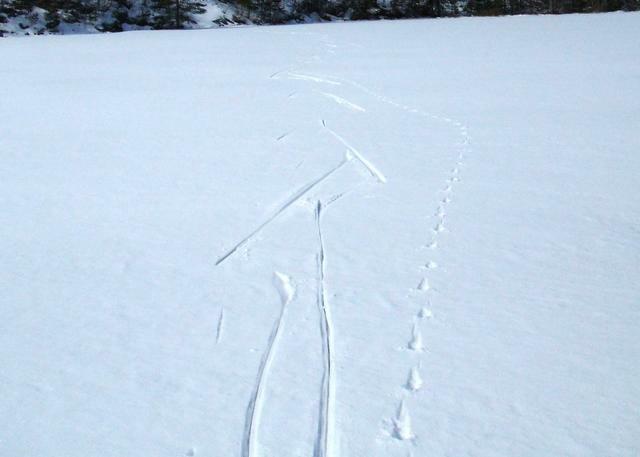 It was covered with 10-15 cm of new snow so we skied instead of skating or kicksledding. 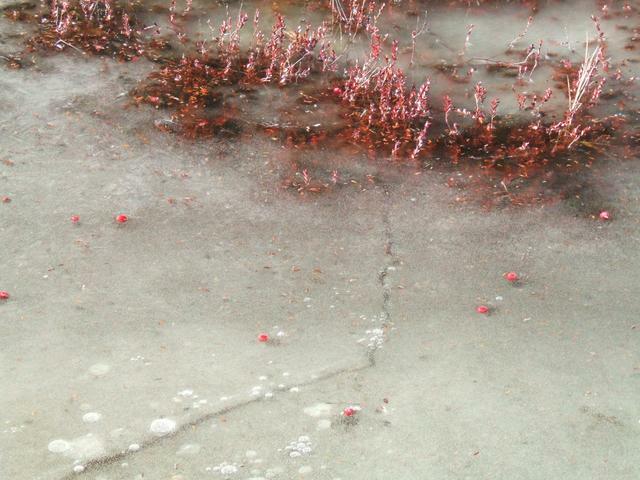 Athough small, this would be a nice skating lake. 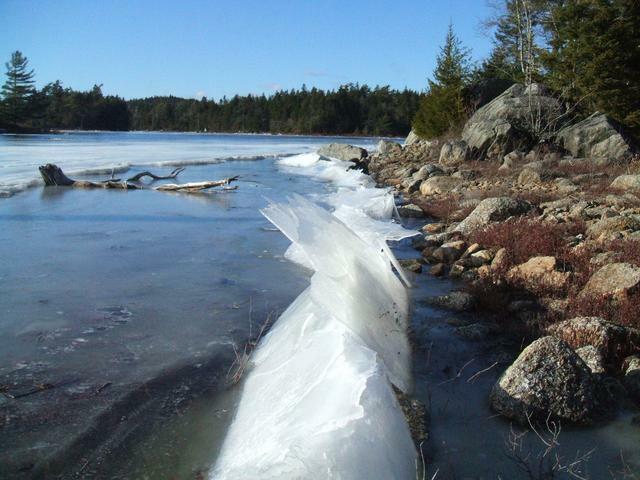 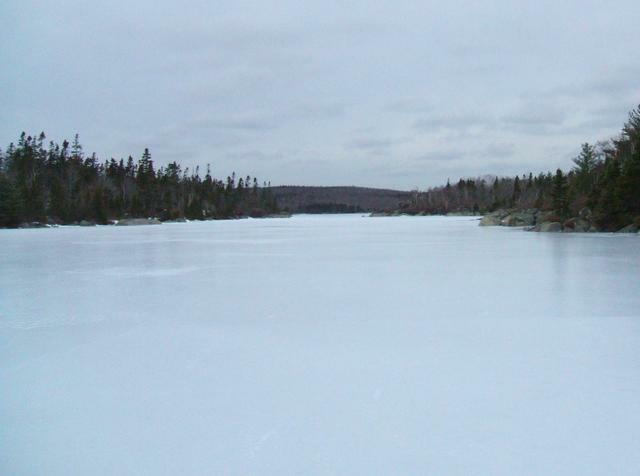 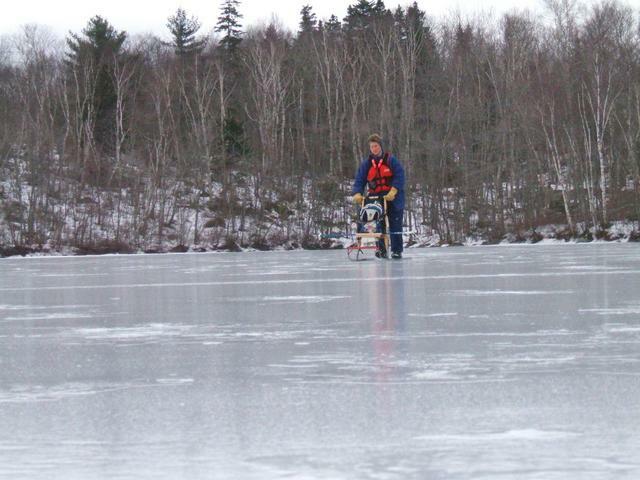 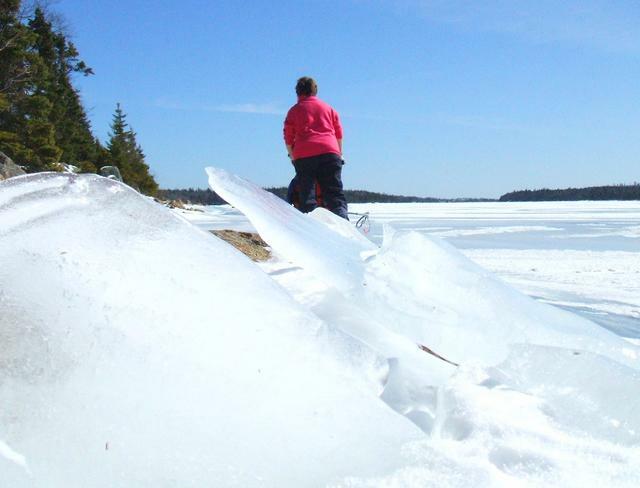 Heavy rains the week before had seriously damaged the ice on most lakes in the Halifax area, but Spider Lake was intact.